It’s much better to make your deal to work someone else’s mining property before you locate high-grade gold there! Dealings with the owners of mining property should be accomplished in detail before a gold prospector or miner begins sampling around on those particular mining properties. This is for the gold prospector’s protection. I have seen it happen quite a few times where a prospector makes a generalized verbal agreement with a claim owner, whereby the prospector is given permission to prospect around on the property with the idea that they will make a “fair deal” if anything valuable is discovered. An arrangement like this might feel more comfortable than hammering out the details of a structured deal before gold is found. But things always look entirely different to everyone involved once a good pay-streak is located on the property! Before a pay-streak is found, the mining claim does not necessarily carry any great amount of value to the bargaining table, because no one knows for sure if there is even any acceptable pay-dirt on the property. This is the best bargaining position for the gold miner! Under these conditions, a ten percent deal is very standard within the industry. That is 90% to the person doing the mining. What I mean by this is that a royalty of 10% of the gross (total) gold recovery will be directed to the owner of the property that is being mined. Once a rich pay-streak is found, if a specific percentage deal has not already been established between the miner and property owner, the mining property suddenly becomes very valuable; and the mining claim owner is in a position to be asking for just about any percentage that he or she chooses. His position will now be that a treasure has been located on his claim, and all that is needed is for someone to come in and develop the deposit. And, of course, he is right! I have seen it happen that a general deal was made between the gold prospector and a property owner “to be worked out in detail if pay-dirt is found.” Once the prospectors located the pay-streak, the claim owner believed he was entitled to 50% of the gross gold recovery. “After all, it is rich pay-dirt on my claim, and all you have to do is dredge it up: 50%–take it or leave it!” A property owner has the upper legal hand unless you make some kind of firm agreement that allows you the right to develop the gold deposit(s) which you discover on his property. So it is not a good idea to strengthen a property owner’s bargaining position by finding a pay-streak on his property before you finalize a percentage deal. Some final arrangement should be made before sampling is started, with the value of the mining property taken at face value at that time. Just like in partnership deals, the arrangement with a property owner should be thoroughly discussed: Is the royalty going to be ten percent of recovered gold weight? Or, is it going to be ten percent of the complete range of nuggets, flakes, and fines? Is the split to be done on a daily basis? A weekly basis? Monthly? At the end of the season? Does the owner want to see the gold split up? How many dredges or sluices can you use on the property? Does the agreement allow you an exclusive right? Or might you find yourself competing with other gold miners on the same property? These are the types of things that need to be agreed upon during the very early stages. The time frame is another thing that should always be discussed with a property owner. You should be comfortable that the property owner is not going to suddenly decide that your time is up on the claim, until after you have had a reasonable opportunity to mine out the high-grade deposit(s) that you have discovered there. One of the richest gold deposits I located in my early years was turned over to one of my competitors by the claim owner, because my competitor made an offer to give the owner 20% of the gold recovery (from a deposit that I discovered). My deal with the claim owner was 10%, because no underwater deposits had ever been located there before my arrival. But because there was no discussion about my exclusive rights to what I discovered, or how long I could mine on the claim, when my competitor offered the owner a higher percentage, I was told I had to stop mining immediately and move on. That was real disappointing! If you are not receiving an exclusive right to prospect and mine on the property, it is very important to work out an arrangement that at least allows you an exclusive right to develop any pay-streak that you are able to locate on the claim. Build some protection into the deal so you can be sure that a competitor is not going to be allowed to move in on your pay-streaks; or in the case of dredging, that no one else is to be allowed to move onto the claim up in front of you and cloud you out with their tailings. Competitors come crawling out of the woodwork, once a rich gold deposit has been exposed. Expect that people are around who will try to figure out how to get some part of it, and they will be in there trying their hardest. The main idea behind structuring good agreements in advance is to minimize the amount of conflict and confusion which nearly always results when high-grade is brought into the picture. Well-structured deals with your partners and the property owner will usually allow you to get directly to the business of recovering gold. It is not always necessary or possible to get agreements in writing with property owners. Some people simply do not like to commit themselves to anything in writing, and you cannot push it without causing the person to tell you to just get lost. This does not necessarily mean that these people are lacking in integrity. There are some people around who may consider that there is probably something wrong with your character if a hand shake is not good enough to seal a deal. You will have to find your own way through all this as you go along. However, the more you put at stake on a single mining property, the more important it is to have a written agreement that covers the main concerns. These are the rules of the game that you will be playing. So it is wise to discuss them long enough, and thoroughly enough, to insure that everyone directly involved understands the essential details and are in full agreement with them. In small-scale mining such as hand-sluicing and suction dredging, for the most part, at least in most of the places where I have operated for the past 30 years, the property owner usually receives ten percent of what a dredging operation recovers off of his property. I am talking about 10% off the top of the gross recovery. I believe that it is excessive to pay more than 10% to a property owner, if I have to locate the pay-dirt myself. If the property owner can tell me right where the high-grade has already been located, and it is just a matter of my going in there and developing an established gold deposit, maybe a higher percentage might be justified, depending upon how rich the location is. Seeing is believing! This mostly comes back to basic economics. You are paying for the mining and support equipment in the first place. You are going to pay the operating expenses, the repairs on your gear, and the living expenses for yourself and your crew. You are doing all the hard work. You are taking nearly all the risk. This is all on the possibility that there might not even be any high-grade on the property in the first place. Twenty percent is too much of a demand by a property owner under these conditions. But some will ask or insist. So I just walk away. It’s not like there isn’t plenty of proven mining property available to you these days! One thing to keep strongly in mind while negotiating a mining property deal, is that the bigger piece of the pie you agree to pay the property owner, the less percentage of the pie that you will end up with as your own reward after all the other expenses are paid. This means that the more you agree to pay, the richer the gold deposit has to be in order for you to make anything for your effort. While giving away a higher percentage might not seem very important before you sample an area, just remember that there is a lot of pay-dirt around that will meet your minimum requirements on a 10% deal, which might not meet those very same requirements if you must pay 20% to the property owner. Please keep this in mind: We are talking about giving away a portion of the gross (total) gold recovery. You will still have to pay yourself back for your investment in the mining gear, set up of the operation, repairs, operation expenses, and then split what is left over with the other guys who are helping you on the mining operation. Or perhaps they are also receiving a portion of the total gold for their participation. In a marginal pay-streak, the only person who might be making anything from all your hard work is the property owner! Or, after everything settles out, you might discover that everybody involved is making something, except you! So it can undermine the entire viability of your project if you agree to give away some higher percentage of your gross gold recovery to the property owner or anyone else. When someone asks for an additional 5% or 10% of your gross recovery, the number does not sound like very much. But in the end, that person could be making more gold from your mining operation than you are! Some years ago, a person hired me to help him set up a production dredging operation in Cambodia. The guy was very excited about his prospects for success, based upon some very positive results that I obtained in a different area of the same country. But in order to gain all of the necessary permits and licenses over there in a hurry, he ultimately agreed to give away 90% of his gross gold and gemstone recovery to various officials in the country! And he had not even sampled for a deposit yet! I did not find out about this until I arrived over there and got into a discussion with him about what percentage of gold he was planning to give the guys who would operate the equipment. He was asking me to help him arrange an experienced dredging team from the west. His idea of a partnership arrangement was to allow the crew to split 2% of the gross recovery. Here is an example of someone who liberally gave away the whole pie! Nice guy! Because he had already made his deal with the officials, they were unapproachable on the subject of a renegotiation. Since he could never get help from an experienced crew in exchange for such a low portion of the recovery, the operation never even got started. But the guy did end up losing all his gear and his full life’s savings trying to set it all up. Moral of the story? The more of the pie (especially the gross recovery-pie) that you give away to others, the less chance your operation will succeed, and the less chance the other pie-holders will get much out of it, either. For a claim owner to ask, without a good and visible reason, for some unusually high percentage of the total gold recovery, he is inviting the dredgers to set their personal integrity aside and steal from him, and he most likely will end up receiving less than what would be reasonable. I have talked with a lot of miners over the years, and have found that for the most part, unreasonable property owners usually get treated unreasonably! One good way to get yourself into all kinds of trouble, is to start yelling and screaming out your excitement for the whole world to hear when you have just made some kind of gold discovery. This is just as true even it is just a little find – or even if you are just goofing off! Those people who hear you and your excitement imagine gold finds and bonanzas probably far better than what you are actually into. That includes the property owner. If you make big noise about a small find, word is likely to get around, and the property owner might start wondering if he is being cheated! On the other hand, if you find something nice and contain your excitement, it will be a pleasant surprise to the claim owner when you pay your royalty and he gets more than he or she expected. Please do not misunderstand me. I am not saying to withhold information from the property owner. I am advising you to not allow your own excitement and enthusiasm to create false perceptions which can thereafter get you into trouble. When a person suddenly starts to do really good at something, there might someone else around who wants to make some trouble. This can be especially true when you start turning up high-grade gold deposits! It is better to not advertise for trouble! When you are into a high-grade pay-streak, as difficult as it may be to do, it is good policy to keep pretty quiet about it until after you have finished cleaning it up. Then you can make all the noise you want to, as long as what you are saying is true. But while you are into it, if you do not tell anyone who doesn’t really need to know, you are less likely to become distracted by others who would like to get in on a piece of your action. One other note on this: Since pay-streaks usually form in groups, where you find one, it is likely there are one or two more in the immediate vicinity. Perhaps the others are even richer! So there is something to be said about keeping things on the quiet side until some later time when there is not so much at stake. Mining claims sell for just about any amount, depending upon how much value is being attached to them. Notice I didn’t say: “How much value they really contain!” Mining claims can sell for $200, or they can sell for a million dollars! The best way to determine the actual value that a mining claim holds for you, is to thoroughly sample it. If you are thinking about buying a mining claim that you intend to dredge, it is not good enough to take samples up on the banks with a gold pan. 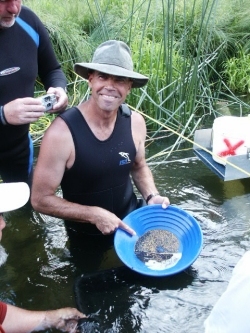 It really takes going out there with your equipment and dredging sample holes to obtain an accurate idea of how valuable the claim is going to be to you as a gold dredger. It also is not good enough to dredge just one or two sample holes and stop there if you find pay-dirt. If you are going to pay a lot of money for the claim, it is wise to dredge more holes to see how long and wide the pay-streak actually is. Sometimes you can choose just the right spot to dredge (or the seller tells you where to dredge) a sample hole and put down in beautiful pay-dirt, only to find out later that it was a single deposit, or a very small pay-streak! This can be very misleading. I have seen it happen a few times! If a claim owner is asking a lot of money for a mining claim, based upon his assurances that it is “very rich,” then he should have no objections to you doing some testing to see for yourself. It would be unreasonable for a seller to expect you to rely entirely upon his assurances. By the way, under the circumstances where someone is telling you how much gold they dug or dredged from the property, ask immediately to see the pictures! What, they got all that gold and didn’t bother to take any pictures? Seems unlikely to me! If there are pictures, match up the background to make sure it is the same property? Watch out for the seller who plays it up real big and tries to get you so excited about all the gold you are going to recover, that you do not feel the need to do any testing! “Oh man, this claim is so hot that it kills me to sell it—but I’m too old to work it and I need the money …” This is where the con-man is going to try and get you. When dealing with mining claims, if it is worth a lot of money, then it is definitely worth a lot of sampling first! Another way that you can get stung on a mining claim deal, is by buying one from someone who does not really own it, or by paying royalties to someone who has given you permission to mine on the claim, but who does not really own it. With some research, you can locate any active mining claim in the County Recorder’s Office and the Bureau of Land Management records, and find out who really owns it and make sure the yearly paperwork has been kept up. At the same time, you can research to see if anyone else has filed a mining claim over the very same location. If two or more people have filed mining claims over the same ground, future conflicts are likely, so it may be wise to look for another mining claim. Perhaps it is not necessary when you first make a percentage deal over a claim with a person who apparently owns it. But if you get into large amounts of gold, it could be worth the little time it takes to verify who the actual owner is. Or, rather than buy a mining property, perhaps the better idea is to join up with a prospecting organization that freely makes mining property available to its members. You can turn up a large number of such organizations simply by doing some word searches on the Internet. Just as an example, our organization makes 60+ miles of gold-bearing property available to our members at the cost of just a small fraction of what a single mining claim would cost to buy in the very same area.